we are accepting deposits on this litter now. We are Extremely excite to welcome Bonny to Canada. Bonny was imported from Germany in 2018. I can not even start to describe what a fantastic dog she is. Bonny was perfect from the second she stepped out of the crate at the airport. She came out and gave me kisses right away, she was very happy to walk around with me and listened to my terrible attempt and her German commands. As I do not know a lot of German other than the basic commands. She is settling in very well and does listen when I tell her commands in English. I have been working on some other training with Bonny and can not wait to see how she does in some other sports this summer. We are very excited to have be able to lease this beautiful girl from her own/trainer Leslie Greenson. Onya is beautiful long coat sable with a great temperament. in 2017 Onya earned her BH title, in 2019 she will be ready for her IPO1 title. Onya enjoys and excels as many different sports, such as agility, dock diving and loves Frisbee. We can not wait to see what these two produce. Yvona comes to us from the highly respected Aritar Bastet Kennel in the Czech Republic. Her mother Tanja Aritar Bastet is the daughter of the legendary Tom z Pohranicni straze and father is Attila vom Gleisdreieck from the original vom Gleisdreieck Kennel in Germany. Yvona is friendly and social with people, children and animals. She has great ball drive, natural protective temperament and amazing hunt drives. She is full of fire and has a super off switch! At the age of 14 months old (minimum for ZVV competition) she made the Czech National title ZVV1 with a score of 86 tracking, 88 obedience, 89 protection. And she was the youngest dog of the trial! We are just thrilled with the opportunity to work with her in North America. Omi was imported from Europe. She is such an amazing girl. Even with our language barrier Omi is responding very well to my commands. I can not wait until this summer to start Omi in Dock diving. She had a litter of puppies and they are turning out to have great temperaments. Yuska receiver her IPO 1 title before the age of 2 in Germany. She is a very gentle girl, her temperament is awesome. She is great with people and good with other dogs. Yuska is amazing with our puppies we have here. She is going to make a perfect mom. I am very excited to see what other titles we can get on Yuska next year. Willow is a beautiful medium boned girl. She has a nice square structure. Willow is the classic black tan with a plush coat. She loves to play and run with the other dogs. She is a very friendly dog and loves to get as much attention as she can. Willow is a lower to medium drive dog, She is very confident and has a great temperament. Willow and Roc are producing puppies with amazing temperaments. So far 3 of their puppies have gone on to be trained as Service Dog for their handlers. Gemma is maturing into a super nice dog with a well balanced temperament. She is medium sized and has a longer coat. She has energy and drive to play but will also settle very nicely when playtime is over and it is relaxing time. Gemma is very quick and will be working toward her lure coursing and herding Instinct titles in May and June this summer. We will also be starting Gemma with Dock Diving as she loves the water and will be a natural at it. Gemma is very easy to train and willing to do nothing to please me. Sasha is from our own breeding program from Jessie and Garak. Sasha is a very smart girl who loves to work and please already. Sasha will be starting IPO training later this yr. For now she is just enjoying being a silly girl and enjoying life. Fire has a perfect temperament and is a pleasure to have around. She is amazing for Disc Dog and also loved Dock Diving. We will be continuing Dock Diving with her this summer. Fire will have one more litter in 2018 then she will be retired. You could not ask for a better dog that Firefly, she is amazing as I will be sad that she will be retired. Kira is a one of the best dogs we have ever owned. She is a large female but very gentle. Kira loves to work and is always looking at us for approval of what she is doing. Kira has had extensive training and has achieved many titles for such a young dog. Kira is working on finishing up her ADV Rally the first week of March. She will enjoy this summer as she will have her very own agility field. Kira is always worried about the other dogs and looks out for the other puppies. Jessie is a fairly big and solid female, She is very confident and has an amazing temperament. Jessie love to still work for me and enjoys our time together playing ball. Jessie also enjoys the water, I am hoping next yr she will be part of our dock diving team. We look forward to a wonderful future with Jessie and also excited about the puppies she will produce. Carma is a large female but she is very gentle, don't let her looks scare you. She comes from an amazing pedigree and I was honored to have her as part of our pack. She has had extensive training and I am looking forward to working further with her over the winter to prepare for trials next spring. Zehna has matured into a nice low-medium drive dog, she will settle down nicely once we have stopped working and likes to cuddle. She is a very love able dog, she loves to work and is always looking to please. 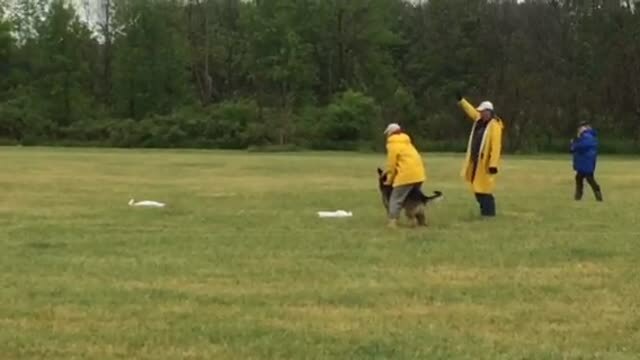 Zehna started to do Schutzhund training when she was 6 months old and was very impressive to her teacher at her love for learning and doing bite work. Zehna is very confident and has a great temperament. Zehna and Garak have had 2 litters so far and we will be doing a repeat breeding Feb 2016. The puppies are turning out beautiful in colours. Some have a very strong and large build. Some of Zehna's puppies have gone on to be Service dogs and being trained in SAR. Misha is and solid medium size female, She had great toy drive.loves to play for hrs and loves to train. Misha had been working on finishing her pre Novice title then we will move on to getting her CD title. Misha is very friendly and loves people. Can not wait until this summer to start Misha in dock diving.